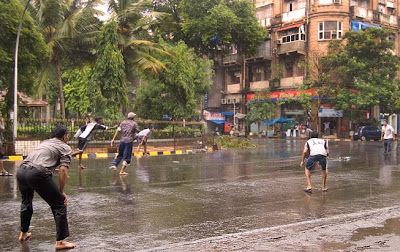 Street Cricket means playing Cricket on street instead of a Cricket Ground. 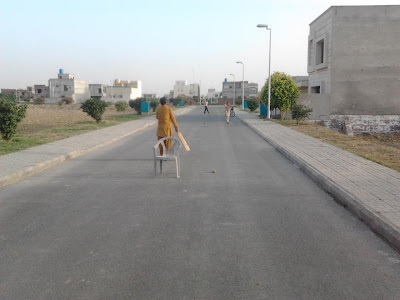 Street Cricket is specially popular In Pakistan and India where youngsters plays Cricket on the streets near their houses. Street Cricket is popular In Subcontinent because there are less Stadiums available to play for the youngsters so they enjoy this beautiful game on the roads. In Street Cricket many interesting rules are also kept which not exists in the real Cricket. for example if ball went to house of someone then it will be out not a six. there will be no LBW. This type of Cricket can also prove dangerous sometimes as it is played on street so it can cause accidents. the ball which is used for Street cricket is tennis ball which is taped mostly. For doing toss mostly coins are used or player of one team keeps something hidden in one of his hand and player of other team guesses in which hand it is. you will be surprised to know that Umpire not even exists in this type of cricket due to which disputes also takes place often. there is also no technology to check if a player was out or not? Even I grown up playing Cricket on the streets near my house because there was no Cricket ground. Many Famous Pakistani and Indian Cricketers also grown up playing Crickets on street like Boom Boom Shahid Afridi, Saeed Anwar, Rashid Latif, Younas Khan, Irfan Pathan, Virat Kohli and Zaheer Khan. During his childhood Shahid Afridi broken Windows of many houses by hitting the ball hard. recently team of Aaj TV visited that area where Afridi played street cricket in childhood. Citizens told that Afridi used to play Cricket all the day here and he also broken Windows of many houses. Today same Shahid Afridi is considered one of the best hitter of Cricket bowl in the world. The other name that is used for Street Cricket is Galli Cricket. In Urdu street is called Galli. this is why it is named as Galli Cricket. Governments of Subcontinent countries Pakistan, India, Bangladesh and Sri Lanka should work to make more grounds so that Kids can play Cricket in grounds from early ages and become better Cricketers in future. It will also help greatly to prevent the accidents.